The new 3D laser sensors from the ECCO 95 series from SmartRay GmbH, Wolfratshausen, combine image processing in full HD quality with scan rates of 10 kHz, along with a 3D point rate of more than 15 million 3D points per second and real-time data transfer. Housed in a compact industrial grade design with a simple interface, the sensors provide technically and economically efficient solutions anywhere where extremely small parts, dimensions and tolerance deviations have to be reliably measured and evaluated in extremely fast cycle times. EConomical & COmpact – like all of the members of the ECCO family from SmartRay, the ECCO 95 series in the compact class of 3D laser sensors boasts impressive technical features. SmartRay’s ECCO 95 Series is initially bringing two models onto the market: the ECCO 95.100 with a field of view of 100 millimeters and the ECCO 95.010 with a field of view of 10 millimeters specially for demanding applications in electronic component manufacture. As the premium sensor series part of the ECCO family, the ECCO 95 sensors are the new “3D measurement of things” with the combination of resolution and measurement speed. This is made possible by the new sensor platform with innovative electronic design along with blue laser technology and a tailor-made optics. The sensor’s full HD image can generate up to 1920 3D points for each 3D profile – i.e. for every scan. Combining this with an opto-mechanical design, it is possible to reach sub-micron vertical resolution down to 0.4 µm and a lateral resolution of less than 5.8 µm, exceeding the challenging requirements from the electronics and semi-conductor industries. This unfailingly makes even the smallest parts and tolerance errors visible. 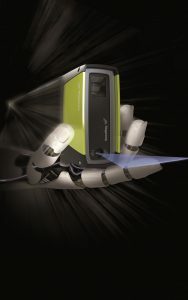 In the process, the user need not refrain from using the highest possible machine throughput: with scan rates of 10 kHz, the ECCO 95 3D laser sensors generates more than 15 million 3D points per second, so that they provide maximum precision and reliability even with extremely short cycle times. The ECCO 95 series’ high-speed Gigabit Ethernet interface ensures data transfer in real time between the sensor and vision software application. There is no need for an additional controller. When you need the ultimate 3D Sensor, the ECCO 95 is the only choice!